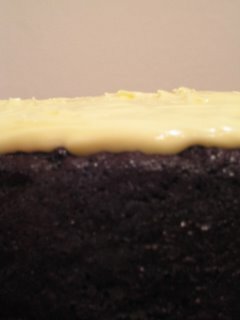 When Greig made chocolate stout homebrew and it was ready just before his birthday, we knew that a chocolate stout cake was the cake to make. We had had the Chocolate and Stout Loaf from Meat on Tory in Wellington. That was good. 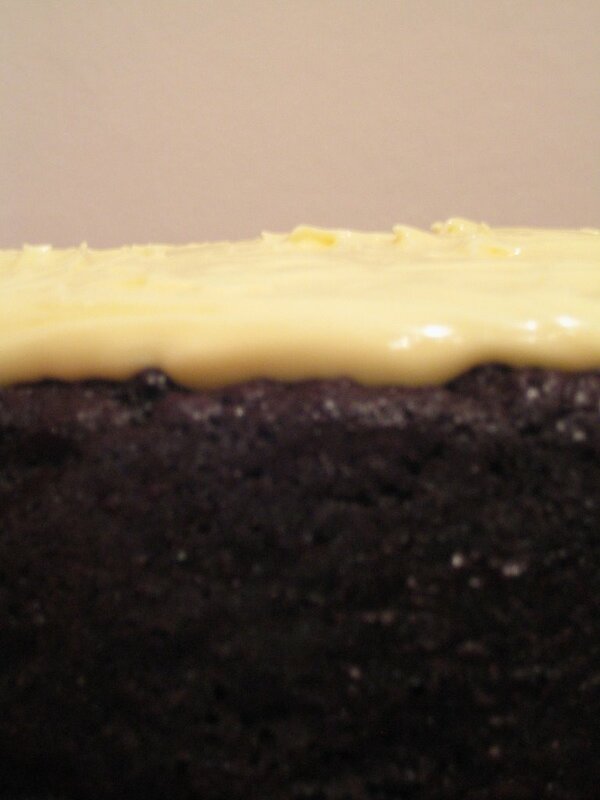 I had also just got Nigella Lawson's book Feast which includes a recipe for Chocolate Guinness Cake. It was perfect. I mean we had Chocolate Stout! And what could be a more perfect opportunity to contribute to Slashfood's Spirited Cooking Here we go. It is a really good chocolate cake - moist, chocolatley, but balanced by the bitterness from the hops in the chocolate stout. And the icing is great. I am not usually an icing fan, but cream cheese icing is fabulous. Probably the only reason I like carrot cake. But the winner for me is the imagery. We all know what a pint of Guinness looks like : a dark, almost black body with a glossy white head - so thick you can write your initials in it which will last to the bottom of the pint. Well I am sure you could do that with this cake. Heat the stout, butter, sugar and cocoa in a pan large enough to hold all the ingredients until the butter has melted. Whisk in the yoghurt, eggs, vanilla and then the flour and bicarb. Pour the batter into a greased and lined 9" springform tin. Cook at 180°c for 50 minutes. Cool in the tin. Make the icing by beating the cream cheese, icing sugar and cream together until smooth. Spread onto the cold cake keeping the image of a pint of Guinness at the forefront of your mind as you do so. May I recommend a glass of Chocolate Stout to accompany a slice of this cake?! What do you mean by 2/4 cup yoghurt? I know this isn't right. Sorry! It is supposed to be 3/4 cup of yoghurt - I'll fix it now. Thanks for lettng me know!